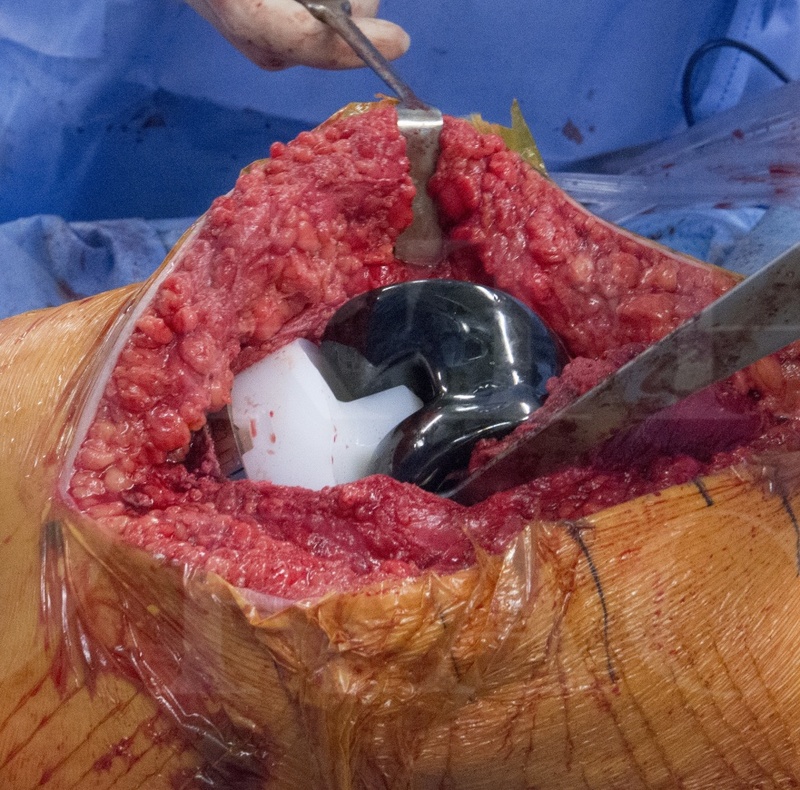 Learn the Revision total Knee Replacement- Legion CCK (Smith & Nephew) surgical technique with step by step instructions on OrthOracle. Our e-learning platform contains high resolution images and a certified CME of the Revision total Knee Replacement- Legion CCK (Smith & Nephew) surgical procedure. This case highlights a very standard revision scenario of polyethylene wear in a previously well-functioning TKR implanted 13 years prior to revision. Whenever a knee replacement starts to fail the patient generally notices pain, swelling or instability. Infection should always be suspected as prosthetic joint infection counts for a substantial percentage of all revision knee replacements, approximately 30%. In this case however there were no reasons to suspect infection and the investigations were standard for revision TKR, including plain radiography and CT scanning. Basic blood tests are performed prior to revision replacement including full blood count, urea electrolytes and creatinine, liver function, group and save and of course a CRP. In this case the patient, a 67 year old lady, was suffering with pain and swelling developing 13 years after a primary TKR which had previously functioned very well. The development of pain or swelling in a previously happy TKR should be a warning sign for all! Approximately 15-20% of patients after a total knee replacement will have some degree of pain, but this certainly does not mean they should be revised. In this technique I will focus on the reconstruction technique using the Legion Condylar Constrained Knee (CCK). However there are also more general points and important principles in revision knee surgery which this case and technique illustrate. The important stages of a revision knee replacement for me are; diagnosis, investigation, preoperative planning, approach including backup plan for extension to improve access, sampling, debridement and extraction, joint line assessment and reconstruction, management of bone loss, fixation strategy, implantation, closure and rehabilitation. A whole text book could be written on these alone, but that is not the purpose of this technique. I hope you find this triggers an interest in a hugely expanding field of orthopaedics which is technically demanding, but hugely rewarding.